Agrarian economics. Dry farming. Engineered waste. Vaporized nutrition. How are any of these things a function of design? On the other hand: how could they be anything else? 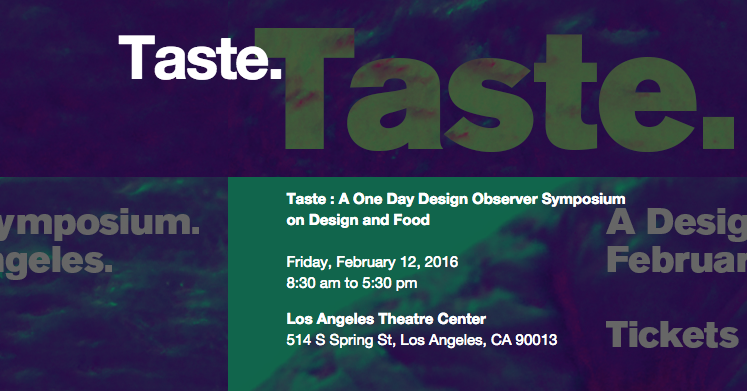 On February 12, 2016, Design Observer will host a symposium on the relationship between design and food. Held in the Los Angeles Theater Center, Taste will feature speakers from across the United States and Europe: we’ll hear from a historian who has traced the origins of artificial flavor; an engineer who has discovered how to nebulize nutrients; and a politician lobbying for national food security. We’ll look at marketing tactics and distribution platforms; climate change and culinary excess; new economies of scale, old expressions of culture—and everything in between. We’ll eat, drink, and be merry, while raising critical questions about where the future of food is headed.